Cold smoking is a technique that preserves food (and gives it a wonderful smoky flavor and aroma) just by smoke, without heat. To get a really nice smoky aroma, it is best to cold smoke for 24 hours. This means that it is best to do this in winter, when the outside temperature (where I live) is around that of the refrigerator and it is no problem to leave a piece of raw fish at that temperature for such a long time. 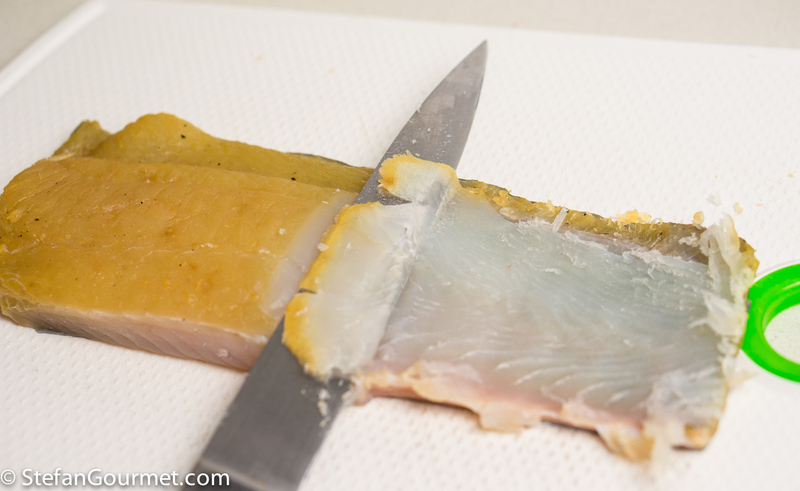 First the fish needs to be cured (the same process as used for making gravlax), and then smoked. For the smoking you will need a grill with a cover, and a cold smoke generator. 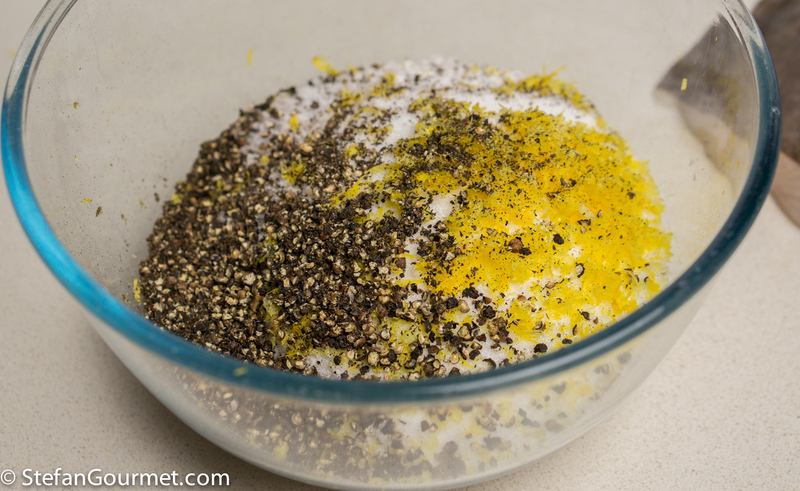 Combine the salt, sugar, crushed peppercorns and zest in a bowl. 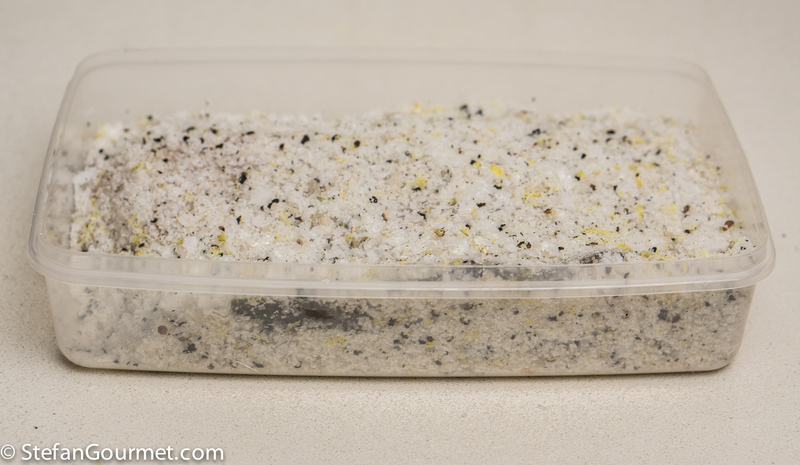 Put a layer of the curing mix in a container, put the halibut on top, and then cover the top with the curing mix. After those 24 hours, the salt will have drawn out a lot of moisture from the fish, thus curing it. 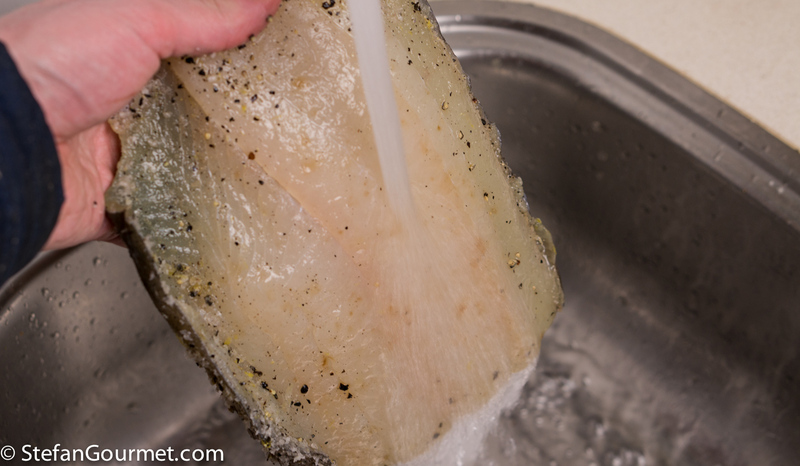 Carefully rinse off the curing mix with cold running water, rubbing the fish as needed. Pat the fish dry thoroughly with paper towels. Cold smoke the fish for about 24 hours. You will need to replenish the smoke generator after each 8 hours. The fish will obtain a wonderful golden hue. Slice it thinly at an angle with a very sharp knife. 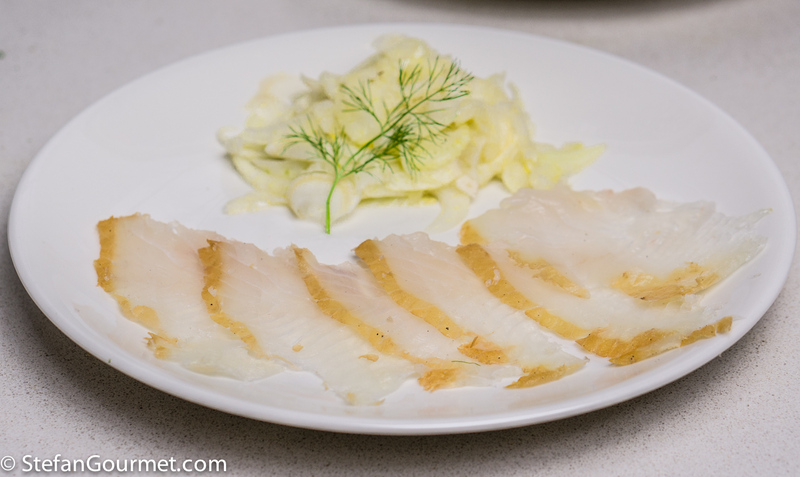 I served it with a fennel salad, dressed with good extra virgin olive oil, salt, and a bit of lemon juice. 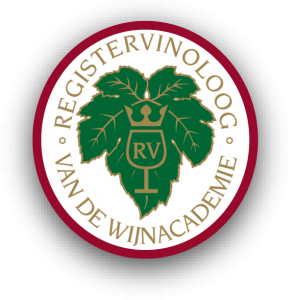 This is great with many dry white wines, especially if they have a hint of smokiness like some pinot grigios. Secreto is the ‘secret’ butcher’s cut of iberico pork. 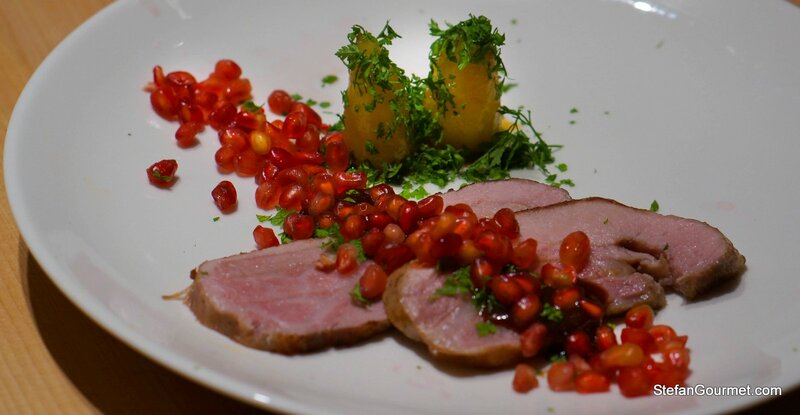 It is great when prepared sous-vide and is served with chervil root and pomegranate. “Senza parole”. Lo sapevo già che non ti fai mancare nulla, ma mi stipusci ugualmente! Looks and sounds quite delicious. Looks delicious. I don’t have a grill but I might try to do it in a large wok. I imagine you can make a nice paste or spread from this too. Stefan, you do the most amazing thing! I always enjoy reading of your endeavors. Stefan, you have so many more choices for fresh fish than we do and Halibut is not one of them. Looked very good. 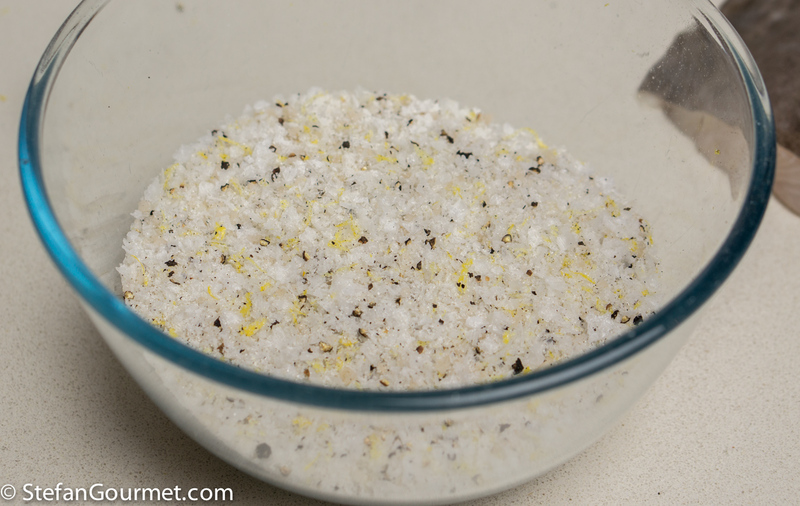 BTW, sometimes when I am cold smoking salmon, I will do some Kosher salt or sea salt to have on hand for seasoning: I just spread it very thinly in a flat dish (or make one from foil) then spritz (mist) it with water so that the smoke clings to it. Hey Stefan, I hope you’re doing well! I had a question about cold smoking. I’ve been hot smoking food for a while but haven’t really tried cold smoking much. The other day I decided to place a stainless steel smoker box (with apple wood chips) over my induction stove. 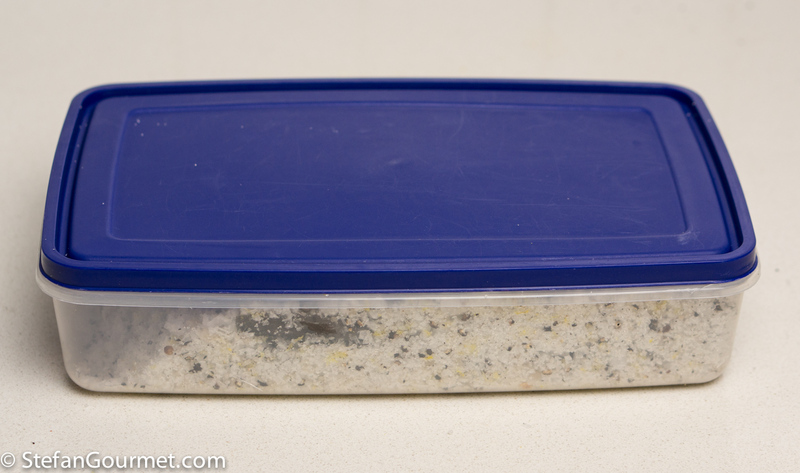 I then placed a dried pork loin above it sitting on a steaming basket and I covered the whole thing with a plastic container. Burned some smoke for a minute or so and left the food inside this contraption for about 10 minutes. The result was great and very smoky. Now when I do it on food that’s wet on the surface, the food becomes inedible (the flavor is terrible). In either case, I can’t find any documentation about smoking food this way and was wondering you might have some personal experience or know a good book or online resource. I guess it’s similar to flash smoking. Anyways, let me know when you get a chance, please. My technique is even simpler, as I don’t even use a stainless steel smoker box but just ignite some rosemary and then cover everything with a large glass bowl. 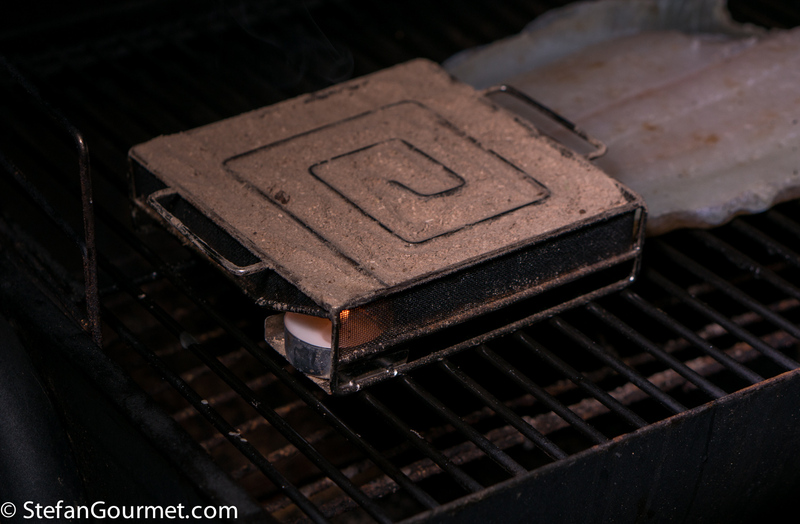 The smoke will only stick to a dry surface, and best to a fatty surface. This is why cold smoking recipes always tell you to allow something to dry first, to create a “pellicle”. There is more information in Modernist Cuisine. Do you have the books? If not, I can look it up for you. Yes, I have the MC books and I’ve read about smoking but something is missing. Maybe I should have another look. I have smoked a brisket for 12 hours for example. A brisket is wet in the first few hours of smoking and yet nothing bad-tasting stuck to it. But then I cold smoked a piece of cooked chicken out of the fridge (yes, go ahead and laugh) and it tasted horrible. Water condensation on the surface of the chicken probably caught some really bad tasting smoke stuff. It was awful. I also did that dry-cured ham test. Cold smoked. The smokiness was incredible after only a few minutes of exposure to the smoke. The pellicle was there. I mean perfect. I guess I’m just trying to figure out how smoking really works and if it’s necessary to smoke something for a long time to get the proper smoke flavor. Look like flash smoking works (like in your rosemary examples) and whatever I did works, and smoking foods for a long time works too… it’s all very confusing right now. Love this… quality! What a gorgeous platter this would make for a Sunday brunch. 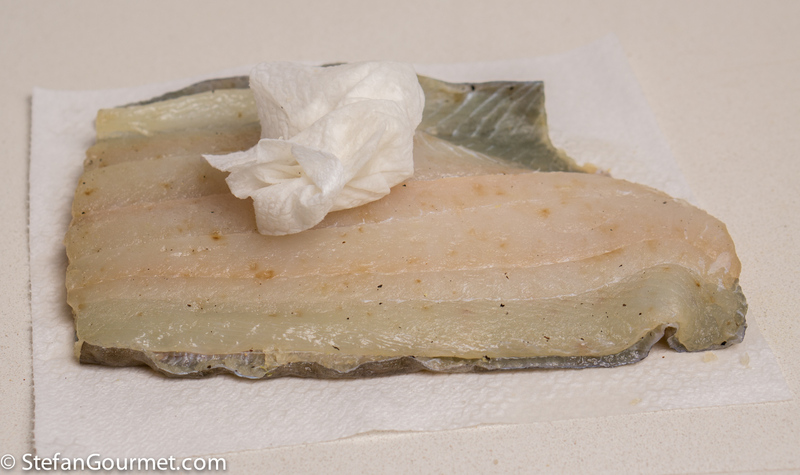 Hi Stefan, wonderful website, thank you for sharing the cold smoking halibut process. 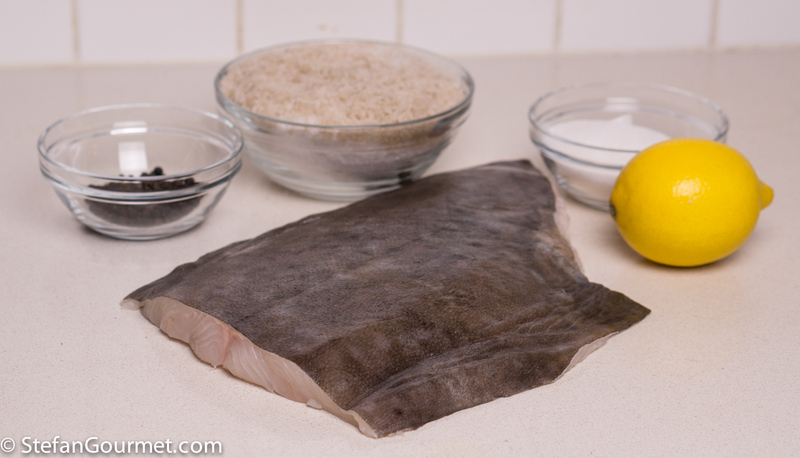 Did you use greenland (black – more fatty) halibut? Or atlantic (white – less fatty) halibut? We have both and currently smoking a piece of black halibut, still at experimental stage & not yet arrived at desirable result. I believe we only have Atlantic halibut here. 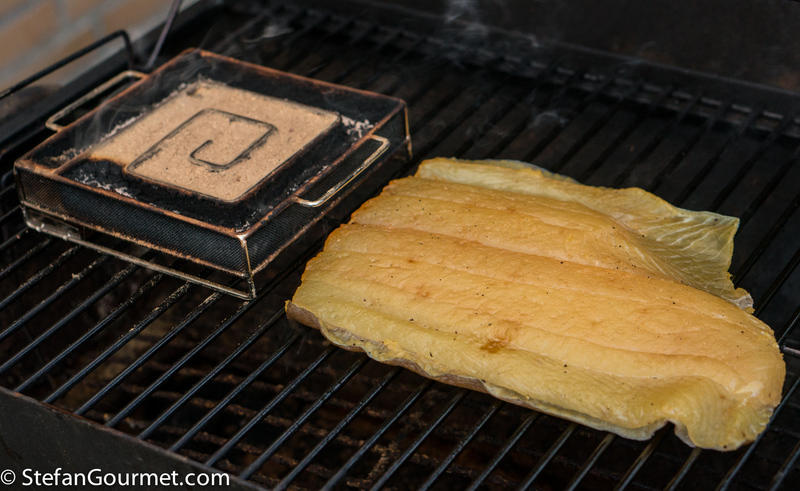 If the black halibut is more fatty, that should work even better for smoking. In what sense is your result not desirable yet? Our goal is to get the fish texture solid & firm (so it can be thinly sliced) like when cold smoking salmon (which we have perfected to our desired goal after much experimentations), however at the moment our black halibut is flakey (just falls apart when sliced) due to exposure to initial warm temp (80+C). 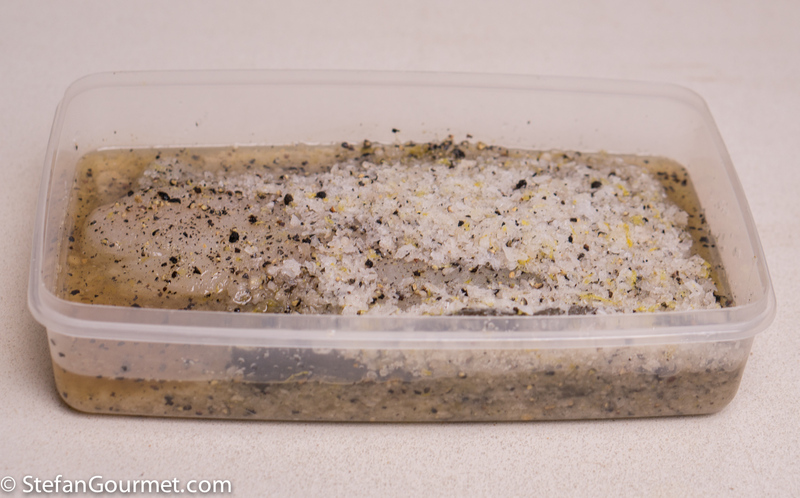 Planning next attempt to dry cure (gravlax style as you recommended) then cold smoke below 40C for 24 hrs. Let’s see. We fish in Norway during summer & been experimenting with indoor cold & warm smoking for abt 4 yrs now. We live in Singapore. No surprise, 80C is way too hot for cold smoking. For best results smoke below 20C for 24 hours, which may be difficult to achieve in Singapore! Most fish starts to get soft already above 30C. It is worth looking into the kind of smoke generator that I show in the post. It generates a lot of smoke with very little heat and does not require tending for 8 hours. PS the reason I would recommend below 20C is for food safety, although I am not sure if a higher temperature is safe because of the smoke.